At this time every year, deer hunters start the chatter of wide-racked, tall-tined buck sightings. For most, it is simply rumors, others may actually have a chance at such a deer but likely will never encounter them during the season. But for some areas that not so long ago were wondering if they would even have a herd to hunt because of a rapid disease outbreak, may now be poised to produce some of the biggest bucks in years. In 2012, many areas experienced a massive outbreak of Epizootic Hemorrhagic Disease or EHD. Though commonly referred to as “bluetongue” what occurred in 2012 was mainly a spread of the EHD Virus (EHDV) and not the bluetongue virus (BTV), although some cases of both were reported. Symptoms are very similar so the average hunter would not be able to tell the difference. Regardless of the pathology of the disease, the bottom line is many deer died. This was even more evident in the dramatically low harvest seen in 2013. So by now you are probably wondering, how does this herd crushing event lead to bigger deer? When deer populations took a dramatic hit in 2012, there were two things that were pretty plentiful – food and space. As deer numbers declined due to the disease, the amount of resources per deer shot up significantly. This meant that deer that survived the disease and hunting season, likely had more resources than normal going into the following spring and summer. In better physical condition than most years, fewer resources were needed to repair the body, and more were able to go toward the antlers. So any bucks that were two or three years old had a good chance of being “larger than average” during the 2013 hunting season. Harvests and sightings were low in 2013, likely supporting the assumption of lower deer populations in those areas. Again, deer making it through had a much greater availability of food and space. Those two- and three-year-olds in 2013, now entered the 2014 antler growing season a year older, and likely in significantly better condition than if the herd was at higher densities prior to the 2012 disease outbreak. So what does this all mean? No one likes to get “skunked” when they hunt. With many populations lowered due to combined disease and average harvest in 2012, many of us got just that this past hunting season. 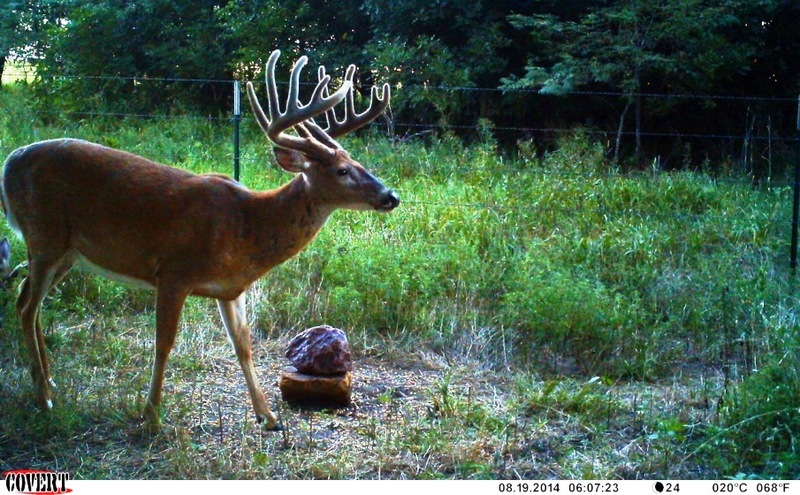 The 2014 deer season may surprise many by putting out some giants from the perennial powerhouse states like Iowa, Illinois, Wisconsin and Kansas. But don’t be surprised if states like Missouri, Nebraska and Indiana produce some record-caliber bucks as well. If you don’t really care about hunting a giant buck then there is still good news. Fawn reproduction was likely very high because of the great physical condition does were in. Lower deer numbers, and most likely balanced buck to doe ratios, contributed to a tighter fawning season which means predator impact was decreased. Where am I going with this? Well white-tailed deer herds are very plastic. No not like a cup; plastic in terms of being very flexible. They can take a hit like we saw in 2012, and bounce back fast. With a great new crop of fawns this season, adult deer sightings will likely be on the rise during the 2015 season.